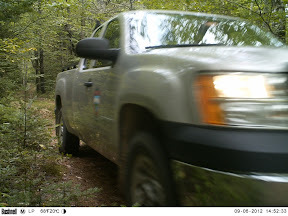 Although I was expecting to capture game on the trail camera, I wasn't expecting to photograph a game warden. In Ohio, we've been calling our game protectors "wildlife officers" for a while, but Maine sticks with the traditional game warden moniker. I was expecting to photograph deer. I was hoping for a buck with a huge rack, but this spike and two does will suffice. 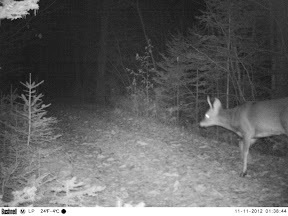 Deer started crossing here only during the rut in early November. 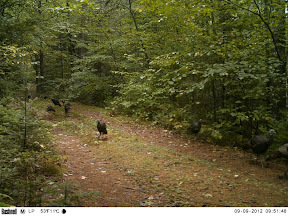 Only once in the five months did wild turkeys meander down this path, but when they did, they came in numbers. 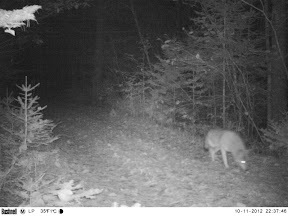 And finally, on the night of October 11, I managed to grab a coyote. 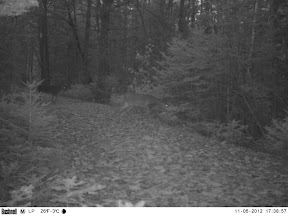 The quick trigger speed barely captured the coyote in the frame, presumably as it cruised nose to the ground from left to right. All in all, this was a really fun thing to do and completely worth the five month wait. I do wish I would have captured animals more frequently, however, this camera was not baited. I would have liked to have captured a bobcat and a porcupine. Maybe images of those species will be on the memory card when I return once again to Maine? The camera is still there.